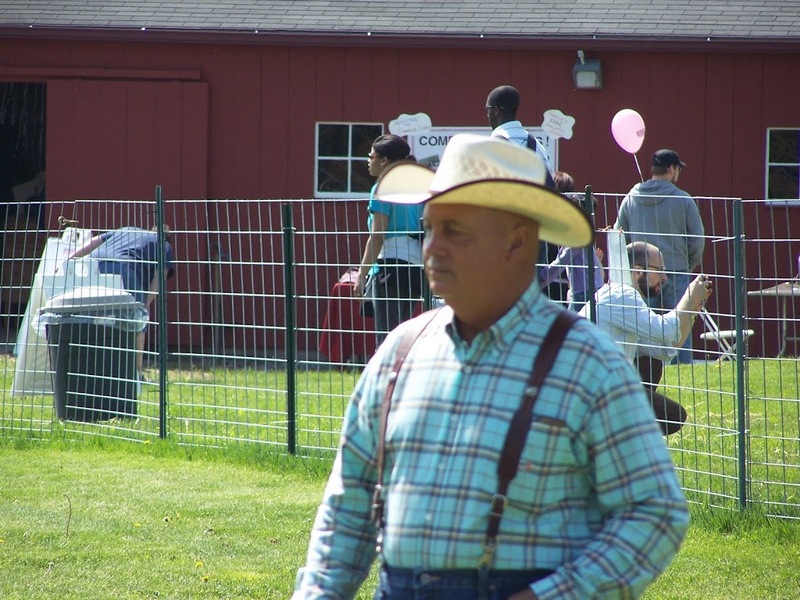 Saturday May 7, 2011 The judge was Mr. Bill Garrett of Garrett Mammoth Jackstock Farms in Stillwell, Oklahoma. 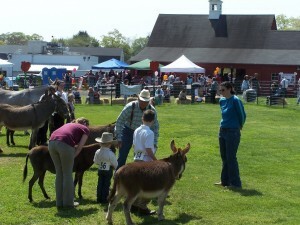 http://www.garrettjackstock.com/ He has been raising Mammoth jack donkeys and breeding mules for over 40 years. Having his experience at the show was a highlight for all who were exhibiting. Several animals in the ring originally came from his breeding program. Over the years upwards of 6000 donkeys have passed through the care of Bill Garrett. It was an incredible opportunity for all who were showing to be in the ring with such a knowledgeable judge. Congratulations to Miss Elizabeth WIlliams who was high point for the day..
Miniature, Standard and Mammoth donkeys and mules came to the show. 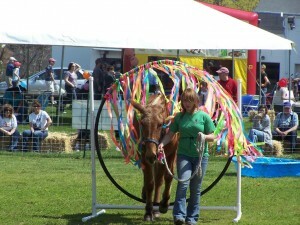 From a very tiny donkey named Peanut to a large mammoth named Sandy there was every color and size to see at the show. In the picture above Mr. Garrett takes time to talk with our tiniest exhibitor who had Mom standing by ” just in case”, but this little lady knew her job and she and Peanut had a great day. Given a direct breeze the streamers were in constant motion as the donkeys and mules walked up to the ring of fire. Most made the trip through the obstacle without notice. The course at this show was one of the best I have seen to date with varied, jumps, common and uncommon obstacles including parts of a disassembled tube slide. 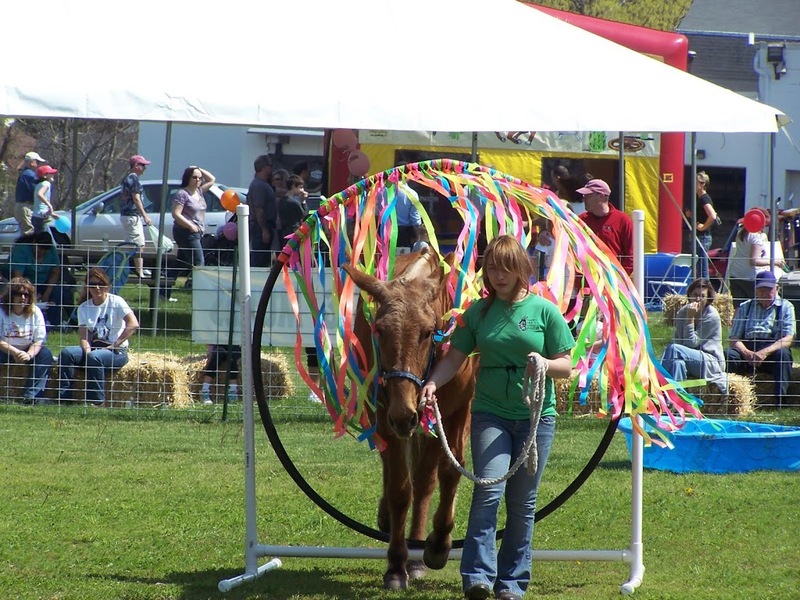 Patience and time go in to training the donkeys for obstacle class. Cookie rewards made the day fun or the donkeys. Some of the newer donkeys on the circuit ( a couple recent rescues included) skipped over obstacles they were not ready for yet but several made the course look easy like Drew Capelli did with his donkey winning the class handily. 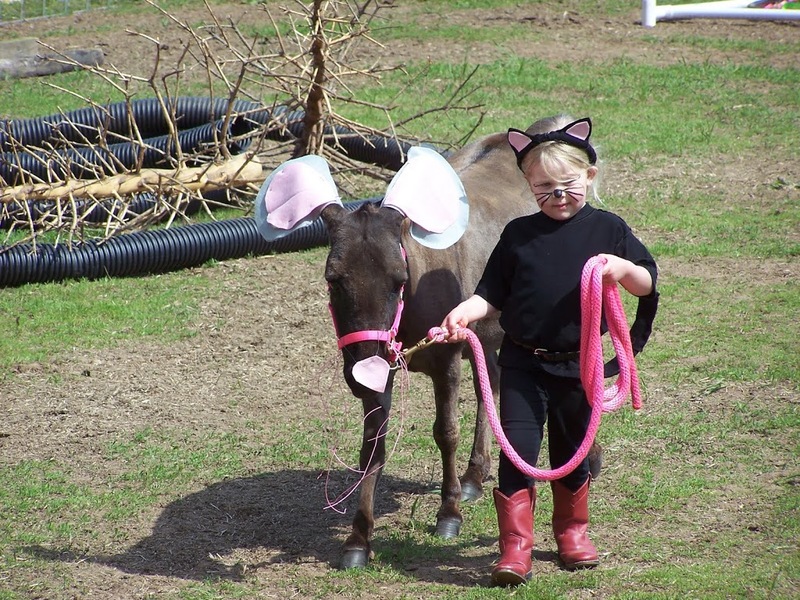 Here our little 3 year old exhibitor and her Donkey a 5 year old miniature named Peanut took the win in the Costume Class. 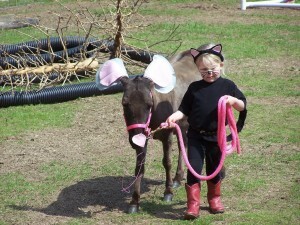 It just doesn’t get any cuter than to see these kids come out and have fun with their pets. I ( Carolyn Stearns – Announcer) http://www.carolynstearnsstoryteller.com/ had a busy day in the announcers booth keeping everybody in the audience informed as to what was happening in the ring. It was important to keep the exhibitors on track as to which classes were coming up. It was an outstanding turnout for the event which tied in with the Bishop Orchard Blossom Fest. 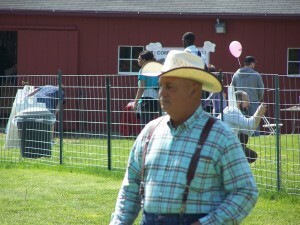 http://www.bishopsorchards.com/ The hay rides through orchards in full bloom ran full all day long. What a perfect way for the whole family to spend the day together. 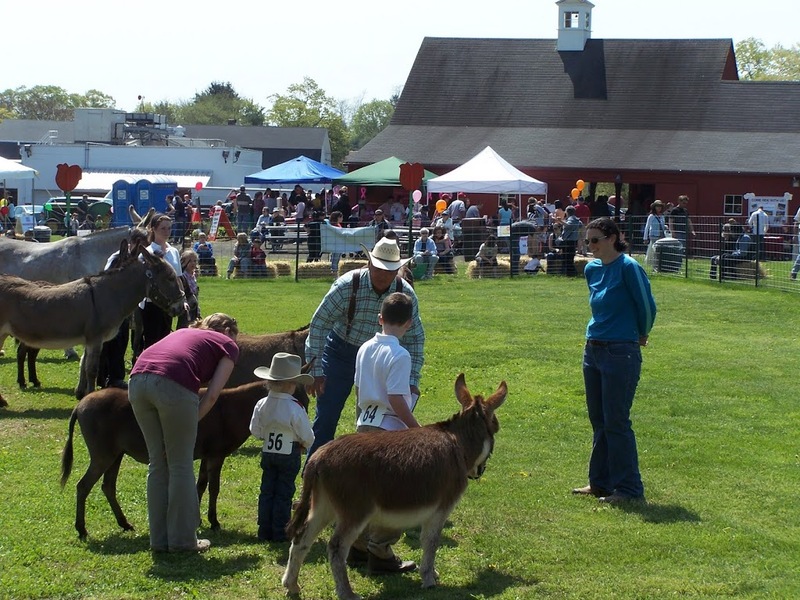 You can find both the New England Donkey and Mule Club and Bishops Orchard on Facebook stop by and see the pictures as everyone puts them up!